I was recently featured on Print Magazine's website as Designer of the Week! It's super exciting and came as a completely wonderful surprise to me. I definitely feel like there are a ton of more worthy designers out there deserving of this feature but it is such a great honor and I couldn't be happier! Look my head is on the homepage! It's almost our one year anniversary and I'm finally sharing our wedding announcement designs! It was so fun to work on a letterpress project for myself where I had the freedom to do anything I wanted. Did I mention they have mint edging? I had them printed by the extremely talented Freshly Squeezed letterpress print shop in town. I couldn't be happier with how they turned out! We eloped in Savannah, Georgia in the private garden of the Davenport House Museum surrounded by close friends and family. I'm not the girly wedding type but it really was the perfect day. We finally started producing some of the Rap Quote materials last week. Below is the final screenprinted poster that I had posted a design for about awhile back. We printed it on French Paper, Construction, Fuse Green, 100# Cover with purple ink. It's so great to see it come to life! This year I entered the GDUSA Magazine Cover Contest sponsored by Neenah Paper. The competition guidelines were to create a magazine cover design that would promote Neenah's digital paper line. Even though I didn't end up making the cut it was a really fun side project to take on. Definitely check out the site and all of the other extremely talented designers' responses. Here are some album cover concepts I created for a band in New York called Meet the Patients. They ended up going with the first concept. I can't wait to see the final product! For a fun work side project I created an illustrated object study based on Suzy Bishop from the Wes Anderson film Moonrise Kingdom. Suzy Bishop is a 12-year-old girl who ends up running away with her love (an orphaned 12-year-old Khaki Scout named Sam Shakusky). I wanted to use hand illustrated type and objects to help carry through the fine art feel and approach of the film and help to portray the personality of the character. As a fun side project at work we were asked to recreate an album, movie or book cover. 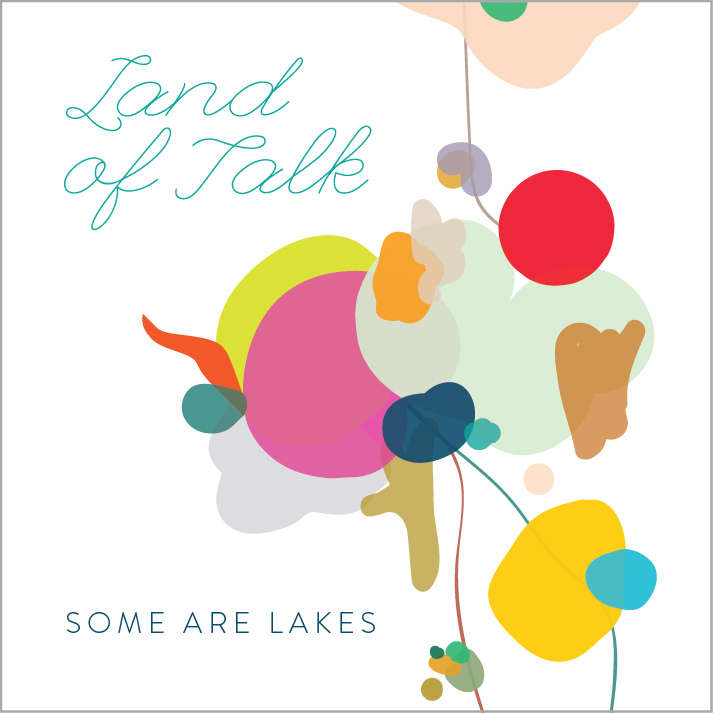 Using abstract shapes and a wide range of colors, I created an abstract vector painting in Illustrator to reinterpret the album cover for Land of Talk, Some Are Lakes. I wanted to recreate the feeling of the album by making it feminine and modern. The design also ties back to the name of album with the use of organic shapes and a flowing composition that is reminiscent of nature and the flow of streams or rivers to larger masses of water. It was nice to create something more loose and carefree. I need to continue to breakout into doing more work that is less client driven and more about trying new ideas and techniques. This year I decided to participate in Goody Goody Gift Swap. I designed and screen printed tea towels for my swap mate. I ended up making a bunch of extras to give out to family and friends for the holidays as well. It was a fun process and I'd love to do it again next year. I hope everyone had a great holiday. Happy New Year! The Carnevale Calendar won a Neenah Unshow Award in the Miscellaneous category! I am extremely thrilled to announce that it is currently featured in the August 2013 Issue of HOW Magazine ! Be sure to pick up a copy and check out page 41. I am very thrilled to announce that the holiday calendar I designed at Carnevale has been featured on one of my all-time favorite design blogs, Design Work Life! I couldn't be more excited! If you are in the market for a new calendar you can purchase this one on Etsy.